This might sound silly to some, but every night, my son and I like to have what we call a mini dance party. After he's done with his school work and we've had dinner, we like to head upstairs, turn the lights down and turn the music up. We like it loud, and yes, we dance and sing along. 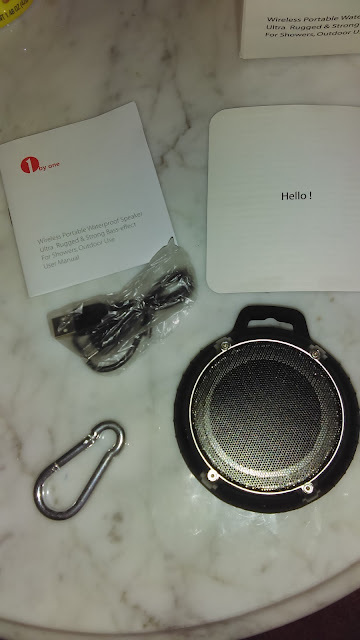 I did say speakers, but with my new speaker, (not plural), from 1byOne, you really only need the one. It's small, it looks and feels like a little tire, and the sound that comes out of it is phenomenal. It's loud. My favorite thing about it, however, is the deep bass. It comes with a USB cord for charging and a small hook that can be attached to whatever you choose. I sometimes hook mine on my belt loop and listen to my music while I'm cleaning up around the house. Now, it's easy to do this since it's wireless and you can stream your music from your device by using Bluetooth technology. Along the side are the function buttons. Phone, mode, back, play/pause/power, forward. 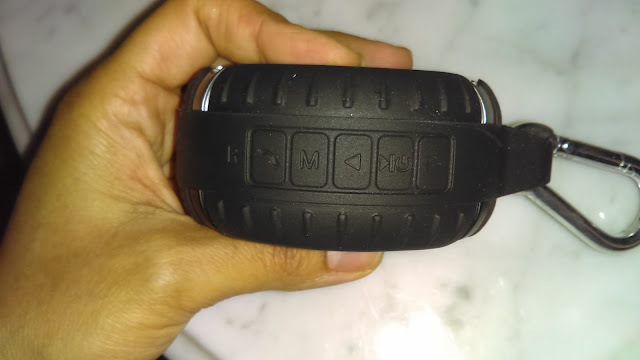 Yes, you can also use it for handsfree phone calls since it has a speaker on it too. So, just in case I'm in the middle of a dance session and Daddy calls to see how we're doing, I can answer his call with the touch of that little button. This speaker is also waterproof, so you can hang it in your shower too! It is very well constructed, so no matter where you decide to take it, it can withstand a lot of abuse from bumps and falls.